Whether it’s the unparalleled vibes or the jaw-dropping list of bass and jam acts, Sonic Bloom never ceases to let fans down. Indeed, bass music aficionados have been eagerly waiting to see two legends return to American soil: Australian glitch maestro, Spoonbill, and UK lord of bass, Culprate. Shaping out the top of their 2019 line-up, the two producers will once again return to Hummingbird Ranch. In addition, rising star Detox Unit, Louis Cole’s KNOWER project, bil bles, Pushloop, Daily Bread, Artifakts, Spectacle, and more. 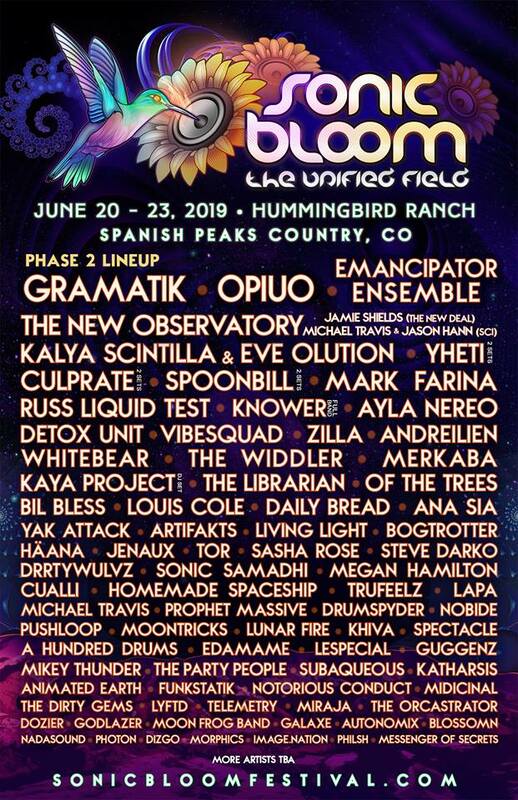 They will all join already-announced phase one talent, which includes Gramatik, OPIUO, Emancipator Ensemble, Yheti, Whitebear, Merkaba, The Widdler, The Librarian, Of The Trees, and many more. In addition to acting as a launching pad for many up-and-coming electronic artists, Sonic Bloom also boasts cutting-edge art, installations, and stage production, along with conscious-raising workshops and an overall vibe that makes it a must-stop for summer. Sonic Bloom takes place at Hummingbird Ranch in Spanish Peaks Country, Colorado from June 20-23. Tickets are available on Sonic Bloom’s website.